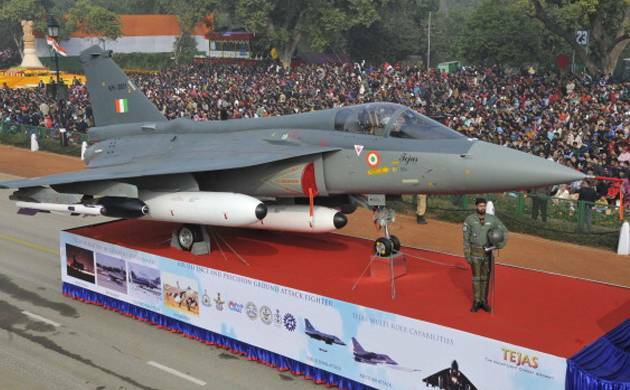 The indigenously developed light combat aircraft, Tejas took to the skies on Republic Day on Thursday. India’s indigenously built light combat aircraft Tejas, made its debut on Thursday in the Republic Day fly past over Rajpath and led the fleet of fighter aircraft. It was after a gap of about two decades that an indigenously developed aircraft took to the skies on Republic Day. Marut was the last indigenous fighter aircraft to be part of the R-Day fly past in the 1980s and the 90s. Led by Group Captain Madhav Rangachari, three Tejas jets flew in ‘Vic’ formation at a height of 300 meters and 780 kmph. The lightweight, supersonic, multi-role single seat fighter was inducted in Indian Air Force’s 45 squadron ‘Flying Daggers’ in July last year. Besides the LCA, “Netra”, an Airborne Early Warning and Control System that can detect enemy aircraft from a distance of 400 kms and direct fighter jets to destroy them, was also part of the fly past. Netra is undergoing evaluation and will soon be inducted into the IAF. hree Mi-35 helicopters, three Super Hercules C-130J, military transporter C-17 Globemaster, two Su-30 MKIs and five Jaguar fighter jets were part of part of the aerial display.MiG-29 and Su-30 MKI aircraft performed thrilling manoeuvres, eliciting thunderous applause form the audience. The Indian Army’s T-90 and BMP tanks, Bramhos missiles, Dhanush gun system and Weapon Locating Radars (WLR) Swati were the main attraction at the parade. The Defence Research and Development Organisation also showcased its Advanced Towed Artillery System and Medium Power Radar Arudha. With its submarine arm completing 50 years in service, the Indian Navy displayed submarines Kalvari and Khandheri, and warship Chennai along with mannequins of the elite Marine commandos. A model of P-81 Longtime Maritime Patrol Aircraft, induction of which has greatly enhanced surveillance capability in high seas, was also part of the Navy’s tableau.